Mathura and Vrindavan, better known as the Braj Bhoomi, are the twin cities where Lord Krishna spent many years of his life. The mentions of these two holy places can be found in various Hindu religious texts. Each year these twin cities are visited by thousands of devotees, especially during Janmasthami, who want to pay their reverence to Lord Krishna. 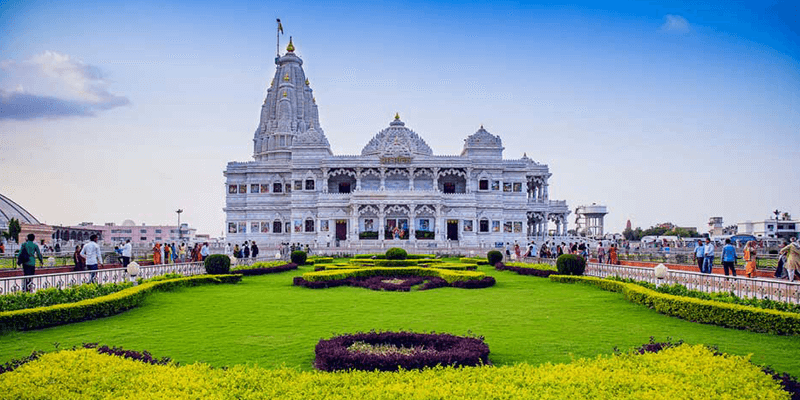 So, on the eve of Janmasthami we thought of taking you on a trip through these twin “Cities of Temples”, as Mathura and Vrindavan primarily consist of many holy temples. 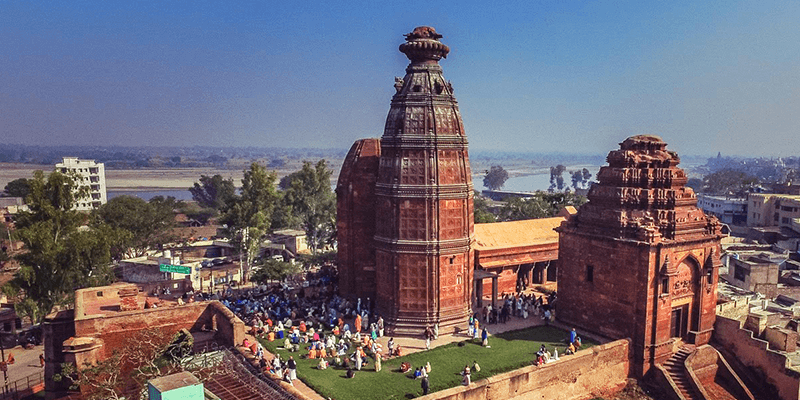 With a day trip to Mathura and Vrindavan tourists can find themselves being transported to the glorious times when Lord Krishna roamed about these cities! 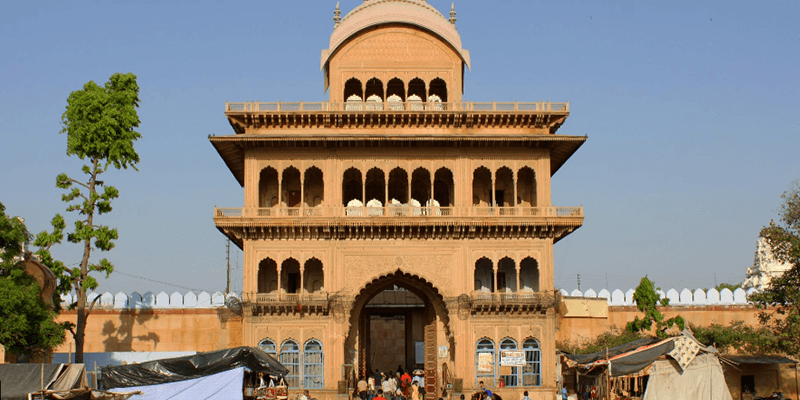 If you want to plan an itinerary around tourist places in Mathura and Vrindavan then below is a must visit list. Dwarkadhish Mandir is the most visited temple in Mathura. The present structure of the Dwarkadhish temple was built by Seth Gokul Das Parikh, about 200 years ago. Tourists are greeted inside the temple by a magnificently carved Rajasthani styled entrance. Within the main temple sits the beautiful black marble idol of Lord Krishna. There is also an idol of Radharani, made of contrasting white marble. The temple also comes with a decorated ceiling depicting various scenes from Lord Krishna’s life. Lord Krishna is worshipped here by the name of Dwarkadhish, or ‘King of Dwarka’. River Yamuna flows by at a gentle pace beside this temple. Must see: Soon after the temple gates close, one should head for the nearby Vishram Ghat to enjoy Yamuna aarti. Shopping: The street side shops near the temple sell the best collection of Bangles. Do care to check them out. Lord Krishna is believed to have been born at the site of this present day temple. Shri Krishna Janmabhoomi complex tries to recreate the times of Lord Krishna’s birth. Relics of the dungeon (where Vasudeva was imprisoned) have been preserved here. Then there is an artificially created cave, where a light and sound show is organized telling the story of Lord Krishna’s birth. The temples within the complex carry beautiful carvings depicting the birth of the Lord in a dungeon cell. Must taste: The sweet shops near the temple sell the best varieties of Mathura Pedha. Do try these yummy delicacies. Tip: Cameras and mobile phones are not allowed inside the temple complex. 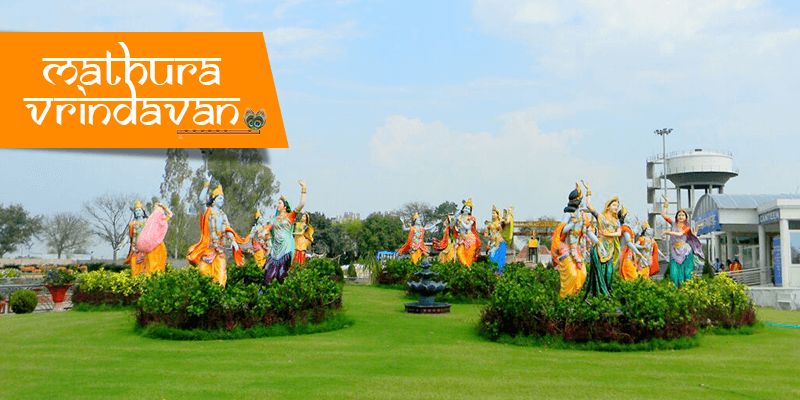 As per the Gita, Govardhan Hill is an embodiment of Lord Krishna himself. 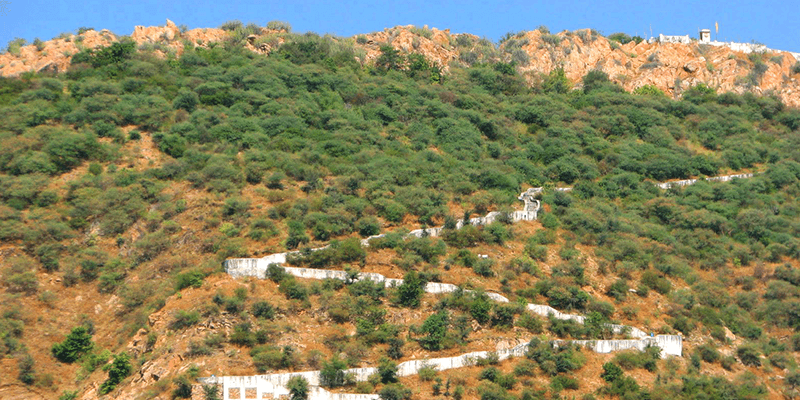 It is believed that Lord Krishna shielded his devotees from a devastating flood by upholding this hill. As the myths go, Lord Krishna and his elder brother (Balarama), during their childhood days, would roam around the Govardhan Hill. When Lord Krishna grew up he played Raas Leela with Radha on these hills. There are five temples situated on the hill which receive a high footfall of devotees all through the year. Jugal Kishore temple is situated near Kesi Ghat in Mathura. The presiding deity of this temple is Lord Vishnu (who goes by the name of Lord Sri Ranganatha or Rangji). The idol of Vishnu can be seen lying on the Seshnag. The architecture of this temple has a remarkable resemblance with those glorious South Indian temples. It was built by the wealthy Seth family of Mathura in 1851. Apart from the Rajput styled entrance gate, the temple also boasts of 15 meter high golden pillars. Tip: Rath Yatra is celebrated with much fervour at this temple. The festivities go on for 10 days. 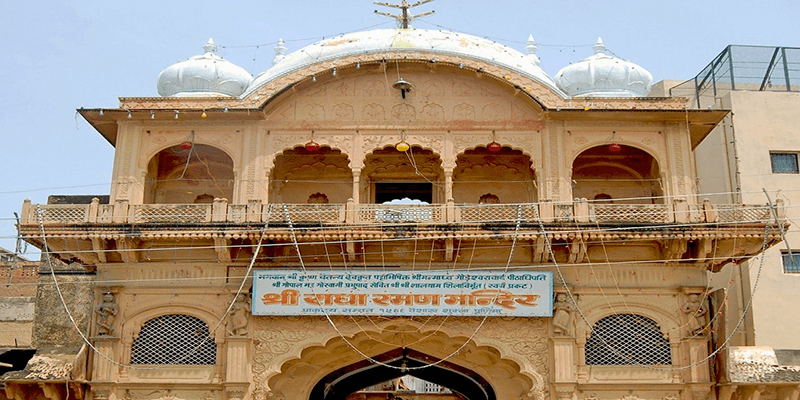 Built in 1580, by a merchant named Ram Das Kapoor, Madan Mohan temple is the oldest temple of Vrindavan. It is believed that Lord Krishna rested at this exact site after killing the demon snake – Kaliya. 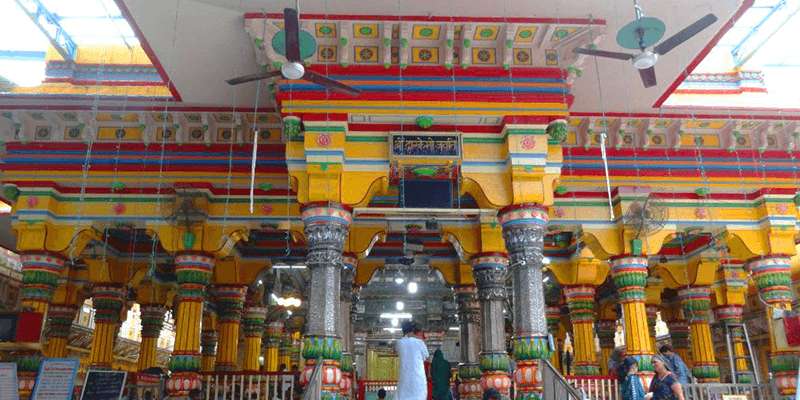 History of this holy temple actually dates back to over 5000 years, when the first temple was constructed by the great grandson of Krishna, Vajranabh. But as time passed the temple disappeared, before Ram Das Kapoor decided to build the modern day temple. Madan Mohan temple stands at a height of 60 feet and is blessed with great beauty. A special dish known as Anga Kadi (which is believed to be Lord Krishna’s favourite food) is offered to the deity every day at the temple. Trivia: The Lord Krishna idol at Madan Mohan Mandir is only a replica of the original idol. During the reign of Emperor Aurangzeb, when many Hindu temples of the area were being destroyed, the priests decided to send the original idol to Karauli (near Jaipur) for safekeeping. The original idol was never brought back! 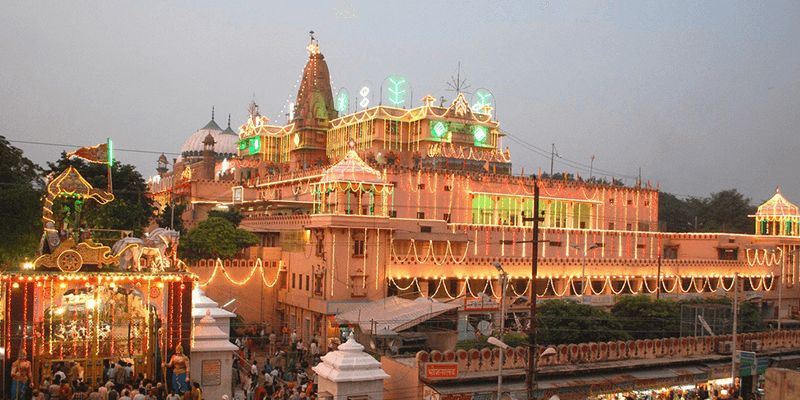 Banke Bihari temple is one of the most revered temples of Vrindavan. Banke Bihari, the presiding deity, means bent in three places. The idol of Lord Krishna at this temple can be seen standing in a unique posture, justifying the naming of this temple. As the lore goes, the idol was first worshipped by Swami Haridas, who was the Guru of iconic singer Tansen. He installed this idol at Nidhivan. It was later brought to the Banke Bihari temple. It is believed that the idol was handed over to Swami Haridas by Lord Krishna himself! Tip: The temple premises are filled with monkeys. So, do not carry any food items in the open to keep yourself protected from them. 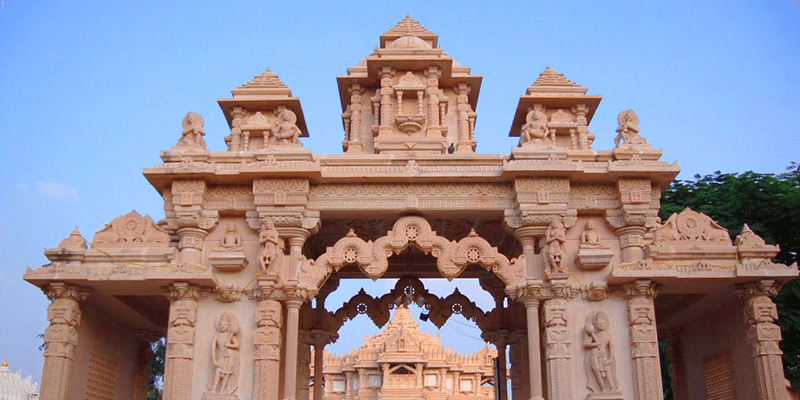 Prem Mandir is one of the youngest temples standing in the holy city of Vrindavan. It was opened for public in 2012 and ever since has been a centre of attraction for the pilgrims. As the name suggests, the temple is dedicated to love and contains idols of Lord Krishna with Radha and Sri Ram with Sita. The interiors of the temple suggest a heavy use of Italian marble. There are beautiful motifs and designs strewn all over the temple. Must see: A musical fountain show is organized at the temple premises every evening from 7 – 7:30 PM. Trivia: 1000 artists worked for 12 years to construct this grand temple. This temple was constructed 500 years ago and is dedicated to the lover avatar of Lord Krishna. Radha Ramana means “the lover of Radha”, but surprisingly there is no idol of Radha within this temple. A crown is placed beside the idol of Krishna to signify the presence of Radha. The Radha Ramana temple’s kitchen needs a special mention. It is believed that fire in this kitchen should never be extinguished and the chefs here keep that belief going. It is also astounding that the same dishes have been served to the deity every day for 500 years! Tip: The tourists are advised to carry along a binocular, if possible, to notice the minute details of the remarkable Radha Ramana idol. Lord Krishna was a remarkable character, and you can enjoy the multiple shades of his life with a day trip to Mathura and Vrindavan. Do care to check out our Mathura and Vrindavan tour package for a hassle free Darshan experience. Next article6 Lakshadweep Islands you must visit on your first trip! 6 Best places in India for a perfect Holi!